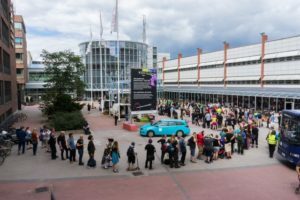 This year’s Ropecon, held in the Messukeskus Helsinki Expo and Convention Centre 29th – 31st of July, has attracted a record number of attendees. 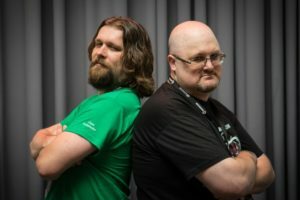 More than 4100 attendees enjoyed role-playing games and other gaming related program during the convention weekend, which is a new record in the 20+ year history of Ropecon. For international visitors, this year’s Ropecon featured an International Meeting Point and provided more programs held in English, from lectures and workshops to various games. The new venue attracted both first-time attendees as well as families with children. 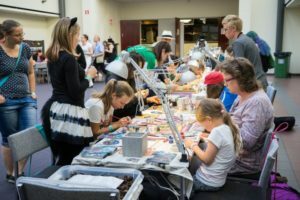 Large numbers of new attendees were introduced to and tried their hands at the beginner-friendly role-playing, card, board and miniature games at the Experience Point during the weekend. The board game library also turned out to be more popular than anticipated. As all of the tables filled out on Saturday, new space had to be acquired from the nearby restaurant area. In the costume competition, the clear winner of the audience favourite category was a life-sized dalek from Doctor Who. The charming pair Viiru and Pesonen (Pettson and Findus), who received a round of loud applause during the stage show of the competition, came in second at the audience favourite category. The assortment of magnificent larp costumes and impressive props displayed at the exhibition area received a lot of positive feedback. On the program side, especially the lectures and workshops in the CrossGames program track, which explored the common grounds and shared issues of digital and traditional role-playing games as well as entrepreneurship in the world of gaming, proved out to be audience favourites. There were also many championships and tournaments held during the convention, including the qualifiers for the Epic Card Game World Championship and the Vampire: Eternal Struggle European Championship, as well as the Finnish championships for the board games Carcassone and Catan. The winners of the miniature painting contest were also announced at Ropecon. Results and rankings of the competitions and tournaments will be published on Ropecon’s website starting on Sunday. Two awards for the work done to promote the Finnish role-playing culture were given out at the closing ceremony of Ropecon on Sunday. The Deed of the Year award was given to Ilona Lamminen, who designed a guide for public libraries on how to start a role-playing game club. The Golden Dragon award was given to Miska Fredman for his long career as a prolific role-playing game designer. The next Ropecon will be held 28th – 30th of July 2017. The venue for next year’s convention has not yet been confirmed.